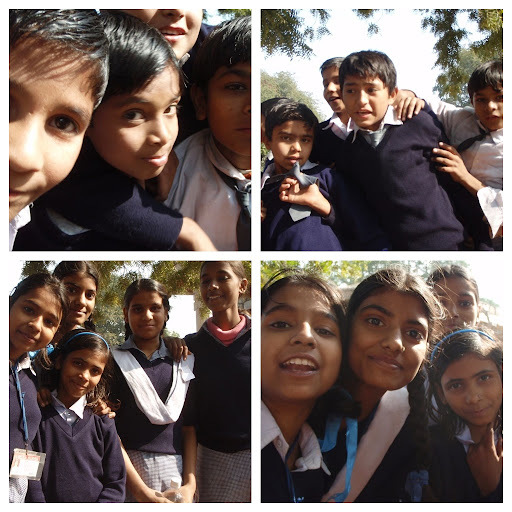 We were at one of the main tourist sites of Delhi and I was being mauled by children. It was good that my friend had warned me this might happen or I might have suspected such enthusiasm was a distraction to lift my purse; not an uncommon occurrence in parts of southern Europe. However, these children genuinely wanted to say hello to the foreigner, shake hands and have their photo taken. Some of them approached shyly in ones and twos and held out their hand with a polite 'hello', but others decided numbers were the key and surrounded me in an excited bubble. "These are not private schools," my friend explained. "Their families are not so well off so they might not have seen a camera many times before." I was surprised by this since the children were all dressed in immaculate uniforms that looked better than most of the private schools at home. There were several different schools visiting this site today, with the group currently accosting me wearing western-style white shirts and dark blue sweaters. Another group that were due to jump me in about 3 minutes wore white shalwar kameez --traditional dress consisting of loose trousers covered with a thigh-length tunic-- and a burgundy school sweater over the top. Presentation, my friend explained, is important in Indian schools and there are monitors appointed to check the children arrive dressed neatly. It was still impressive. To me, white trousers and a day trip did not equal long standing aesthetic bliss but apparently India manages it. I have concluded that children from other countries are just the cutest things ever.